30 years and Carb Counting… and now pumping with Omnipod! I’ve been a type1 diabetic for almost 31 years and have been using an insulin pump for 9 of them. Diagnosed at 10 years old, I was put on the standard (at that time) regimen of injecting NPH (long acting insulin) and Regular (short acting) twice daily and was supposed to adhere to a very tightly controlled and timed diet. Eating too late or too much or getting stuck in traffic all meant that my blood sugar levels could drop dangerously low and I was at risk of having a severe hypoglycaemic episode. I followed this until I was about 27 years old. This was not the best way to be living with diabetes but during my early twenties I stopped visiting my endocrinologist and in fact stopped testing my blood all together for about six months. It wasn’t until I read ‘Dr. Bernstein’s Diabetes Solution’ that I decided to get back to the business of being diabetic and made an appointment at the diabetes clinic at St Paul’s Hospital in Vancouver, BC. I met a wonderful endo named Jennifer Klinke and she prescribed me with the latest insulins available, which allowed for a lot more freedom in my schedule (not that I was really following one). I was still using two different insulins but this time using insulin pens (more convenient) and the short acting insulin was really short acting – as in 2-3 hours and the long acting was chemically designed (engineered0? to last 24 hours and mimic a human pancreas’ basal rate of insulin. This meant that I no longer needed to wake on a schedule and eat on a schedule. I injected short acting insulin when I ate a meal or anything with carbohydrates. 6 months after being on the new regime I was loving the freedom but was also experiencing some very severe hypo’s like never before. On more than one occasion my blood sugar dropped so low during sleep that an ambulance had to be called and on a few others I would suddenly find myself being spoon fed nutella by a friend or family member who had witnessed a drastic drop in blood sugar. At my second appointment with Dr Klinke, she suggested an insulin pump and sent me home with an information packet about a Medtronic Insulin pump. I read the pamphlet but didn’t really consider seriously until six months later when, on a whim, I popped into the Medtronic office and in Vancouver and asked if there was anyone who could show me a pump. Not only did they show me how the pump worked, but even let me feel what it felt like to put the infusion set on. I never had a problem with needles, but definitely the idea of not having to inject 5/6 times a day was appealing. There customer service department contacted my extended health benefits company and let me know that my pump would be covered 80% and I would be responsible for the rest, which I could pay for on an interest free payment plan. I was working about 30 hours a week at Starbucks and they covered 5500$ of my insulin pump – a big reason why I am loyal to this company. Their health care is amazing! I loved my pump from the moment I got it. In fact, my training was on a Tuesday and two days later I went to Vegas with girl friends and had the best vacation control ever. Because an insulin pump allows you to alter your dose for the food you eat, I find it superior to taking shots. For example, fruit will generally enter your blood stream immediately so often I will take insulin 20 minutes before I eat it, something with a lot of fiber or fat will enter your blood steam over time, sometimes hours, so I can program a dose to be released over the course of two or three hours. This is especially helpful on holidays when you may be grazing on food for a few hours – I can set my pump for say, 5 units of insulin to be delivered for four hours and hope that everything balances out. 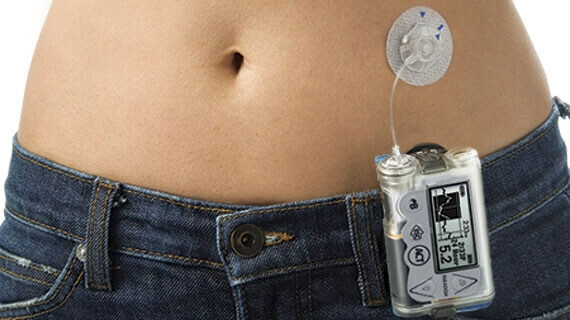 So, although I did love the medtronic pump, I have now switched to the Omnipod tubeless insulin pump and love it. 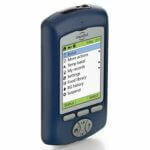 There are two main things I didn’t love about the medtronic pump and Omnipod solved both of those. The first was that medtronic isn’t water proof and I love to swim. I also go kayaking and standup paddle boarding and when in Hawaii I love to surf. 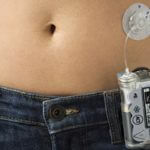 Disconnecting from an insulin pump is only recommended for about 30 minutes because after that your body will set off a chemical reaction that takes hours to recover from and is quite gross feeling. This meant that while surfing or swimming or using a hot tub I’d have to stop, get back to my pump and hook up for a while before getting back to the fun. It also meant that while on a six day camping/kayaking trip I had to wear my pump around my neck in a waterproof case and was never really super relaxed because ruining a 6300$ insulin pump wouldn’t be fun. The other thing that was annoying was constantly finding a place on my clothes to clip my pump to. It wasn’t impossible but kind of annoying in summer when you’re trying to wear sun dresses and your pump keeps pulling them down. After looking into the Omnipod I decided to give it a try. Insurance would cover 100% of the pump and I was very excited to try this pumping without the tubes. When I received the Omnipod system , I was surprised that the PDM – Personal Diabetes Manager was so bulky and looked very 1980’s. The sturdy black plastic is the same as pagers are made out of and having just shelled out 6300$ I was a bit taken a back. This aside, it was exciting to finally have it in my hands. The Omnipod system consists of the PDM which is also your blood testing machine and pods, which you fill with insulin and attach to your body. The pods are a reasonable size and can be worn basically anywhere you would inject insulin. Within the pod is a battery that has a maximum life of 80 hours so every 72 hours you are advised to remove the pod and replace it with a new one. After 80 hours the pod lets out a constant screeching sound and shuts off, so the maximum to extend the life is 8 hours. I try to push the pod as close to 80 hours as possible as that way I’m getting an extra day of podding every 3 days. Many pumpers with tubed pumps manage to wear their infusion sites for days past the recommended 3 day life. So…what do I love and what would I change about the omnipod? I love the tubeless pods. I can wear them under clothes and unless I’ve got them on my arms people have no idea it’s there. I love that the pods are waterproof. If I go standup paddle boarding or kayaking or swimming I can relax and not worry about getting wet – which is a key part of swimming. I put the PDM in a waterproof case or leave it at the hotel etc if I choose to. I would definitely change the PDM. Apparently that change is coming in 2016 and is similar to an iphone, which a touch screen. For all of those sick of the very basic keys of the old PDM this is super exciting! *HYPO – trying to explain diabetic hypoglycaemia is tough but it’s like the confusion of regular hypoglycaemia times a thousand with the fear of dying thrown in. Because glucose carries messages to the brain, when you don’t have glucose in your bloodstream, it is very easy to because disoriented and sometimes violent or agressive because you can’t make sense of what’s happening. My first sign of a low blood sugar is a slight tingly feeling in my brain and then sweating. I am very fortunate that even after 30 years a am very hypo aware so I almost always feel it coming. Some people don’t and it can be very dangerous. It kind of feels like you’re a balloon with a slow leak, deflating.